I really enjoyed this narrative nonfiction tale of Chicago's World Fair... but it wasn't what I was expecting. 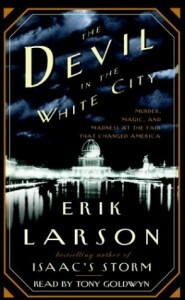 Given the title The Devil in the White City, I thought the book would focus much more on HH Holmes and his murderous castle. While that was certainly a prominent aspect of the book, it focused much more on the political, social, and cultural climates around the Fair. A Scorsese/DiCaprio film adaptation is currently in the works, and I imagine it will play up the drama and horror of Holmes's serial killings.